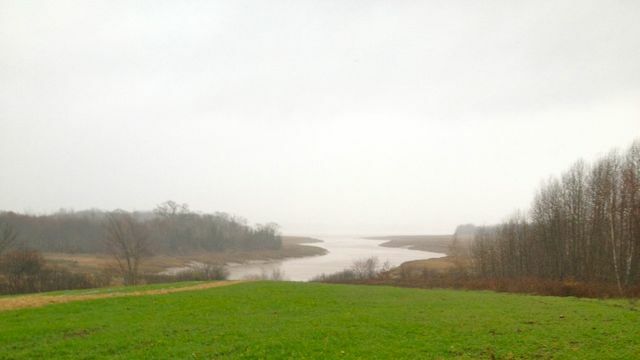 Cover crop growing on back field by the Cogmagun River. A strip of mulched garlic is on the left. In this week’s pack, we plan to offer apples, squash, garlic, celeriac, salad mix, cabbage, leeks, sweet potatoes, a bag of root vegetables, spinach, kale, herbs, and eggs. We are distributing the frozen stewing hens for those who spoke for them. They will make beautiful soup stock! If you want extra kale for freezing, this is the week! Let me know how many extra bunches you’d like. They are $3 each. Two Fleming park gals were raving about the yummy meals they were making with kale. They graciously shared the recipes (below). I’ve also included a couple of links to introduce celeriac (which can be intimidating, but ultimately rewarding) and some great ideas for using other root vegetables. The websites are worth a scan for other delicious ideas too. OK, it was cold, and muddy, and we’re having vehicle difficulties. We’re missing Cassie and Stephanie. But we are feeling so grateful to all our customers who stayed with us right to the end of the season. Thank you! We are also feeling grateful for all the leaves you’ve brought to us too. Those leaves are adding significant amounts of carbon to the livestock pens. 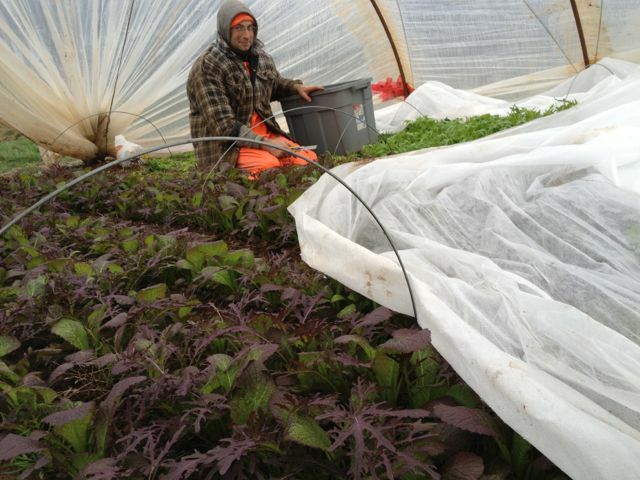 The bedding gets shovelled out and composted, and the compost is used to fertilize and build the fields. It is a really exciting process! Thanks for the truckloads of leaves! 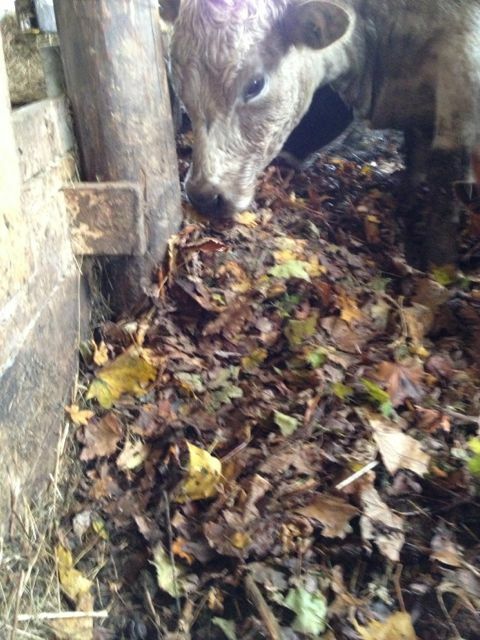 Leaves in the barn add carbon to absorb nutrients, help with composting, and make the animals more comfortable. Another winter preparation job is changing the water from above-ground lines to below-ground (frost-free) lines. There is a frost-free line in the barn (yay!) 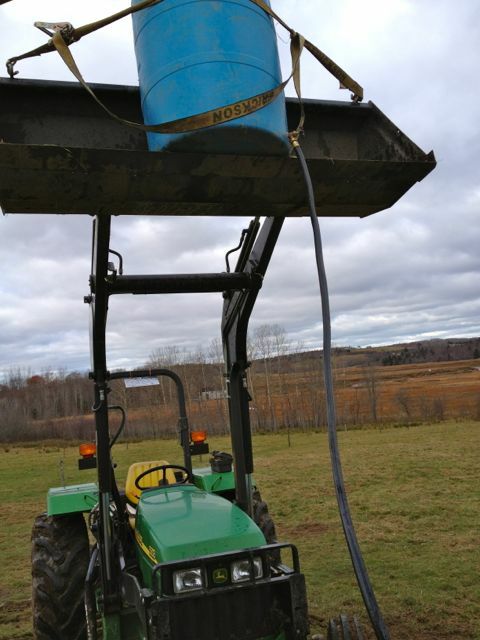 and for the animals on pasture, we fill up a barrel at the barn, bring it up the hill with the bucket-loader, and fill up another barrel with a waterer attached to it. 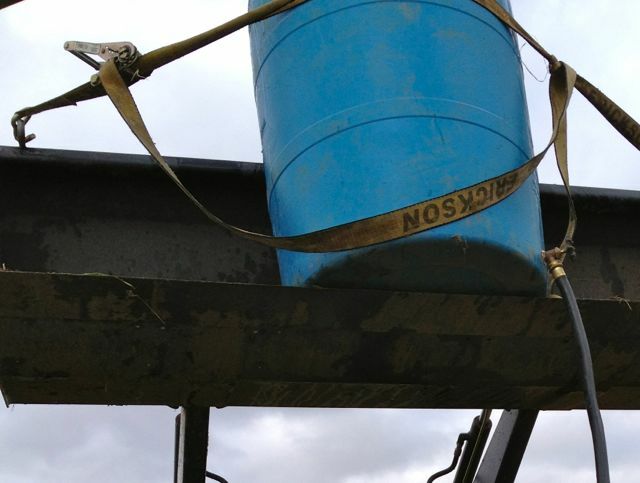 This is a fun process, but I was intimidated by a critical tool, the dreaded ratchet strap. I have been struggling with them all summer. Below is a close-up. On the left is the gear assembly that I’m supposed to be able to use, but no matter how much I practice, it evades me. I just couldn’t let it get the better of me. So I finally (without any on-lookers) took a deep breath and got the strap off. These little victories are so empowering. We have also been looking for a source of used (free) vegetable oil to use as fuel in our old diesel truck. We did the rounds of a number of establishments with deep fried foods on the menu. Most places take the oil out of the deep fryer after a day (or a week – ugh), and put it outside for pick-up. The idea is, we pick it up, filter it, and use it in our truck’s second tank. It’s a little messy, but it sure saves money on fuel! We encountered two problems. One, the truck developed a serious oil leak last week on Thursday. We had it towed to our home garage. They looked at it and said “we can’t fix that.” So we had it towed to another garage in Windsor where it sits, waiting to be looked at. The suspense is killing me! The second problem is all of the places we asked for used deep fry oil were not able to supply it. On my way home, I stopped in to the local pizza joint and hallelujah! The kind lebanese man said, sure, I can save the oil for you. We will keep looking for more sources, but I’m using this little victory as encouragement that we’ll find more veggie oil for the truck, and we’ll get the oil leak taken care of soon. As the 2013 season comes to a close, we are already getting excited for the coming year. Our plans include expanding to 200 produce packs, building more greenhouses, and planting a plum orchard. These efforts reflect our desire to build a business that nourishes everyone connected to it. Next year we plan to have a lot more carrots, earlier potatoes, more consistent lettuce, and more fruit variety. Improving the overall quality of our produce is an endless process. 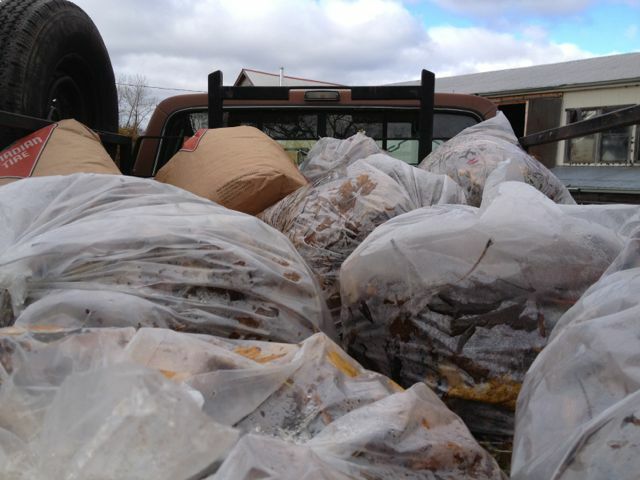 We are increasing our compost production this year with the addition of leaves and straw to our cow and sheep bedding. Last year we bedded with moderate amounts of waste hay and made about 70 tonnes of compost. We hope to double that in 2014. In addition to composting we are getting our cover cropping program established. This past season, we brought a lot of new fields into use. Now we have enough space to have soil-building crops on half of our land every year. Cover crops are a great way increase the fertility of the land while greatly reducing weed and disease problems. If you filled out the online feedback survey, thank you! We will be getting the results soon. If you didn’t, or have something further to tell us, please get in touch. We base most of our decisions on what we hear from our customers, so please let us know what would improve the packs for you. Since we are expanding, feel free to tell your friends about us. We will invite everyone from the wait list, and also have room for more. For those who are interested, they can go ahead and sign up on our website.